It recently occurred to me that I never showed you all the fruit of my labor in the front flowerbed. 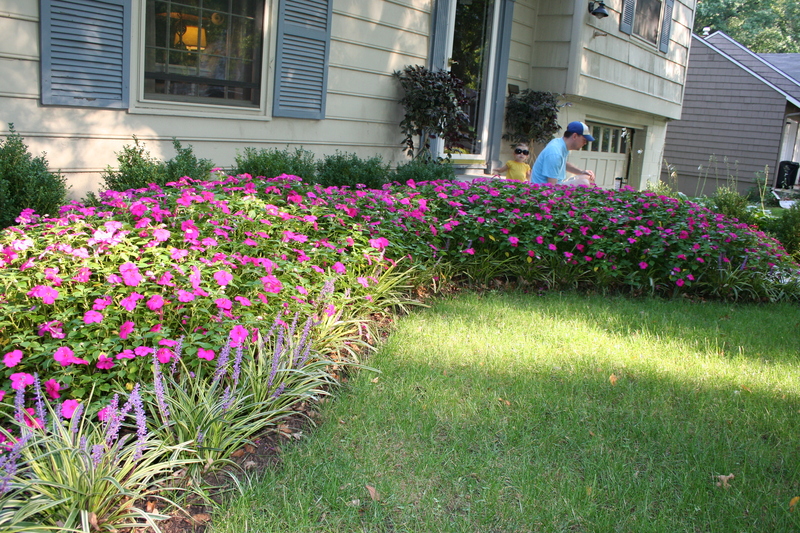 Way back in May, I wrote here about my ridiculous idea to plant a bunch of Impatiens in order to spruce up our curb appeal. In the end, I planted a total of 384 of those skimpy little plants. After I finished, I expected to gaze upon my hours upon hours of work and feel proud. Quite the opposite, actually. I stood over the itty-bitty things and couldn’t imagine them turning into the big, lush, bushel of fuchsia I had originally planned for. Fortunately, after a few weeks, I was pleasantly surprised with the results. I got exactly what I was hoping for. 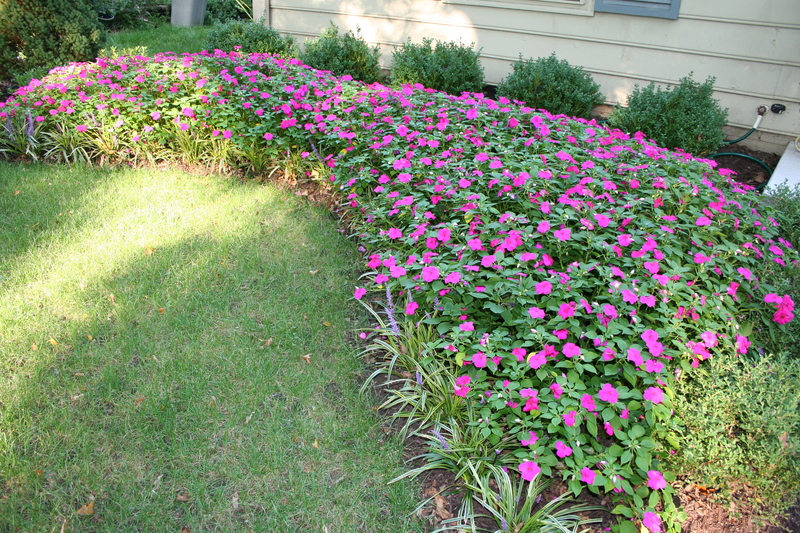 The Impatiens are great and all, but the real transformation is the yard/flowerbed as a whole. 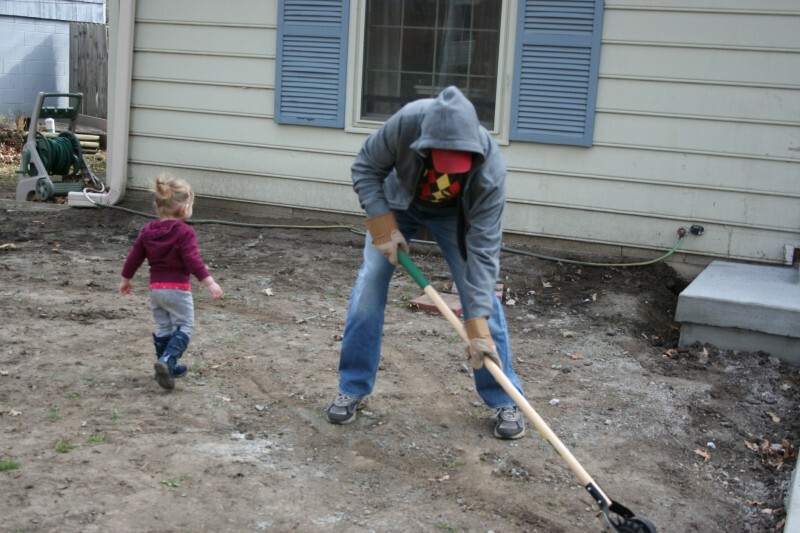 After the foundation peeps came in and destroyed our entire front yard last winter, grass and everything else, we were literally left with a huge patch of dirt in the front yard. Trav and Arle worked their hineys off to get green back in the pic. We did everything ourselves and are pretty pleased with the results. Except our pine tree is looking a bit sickly, but compared to the rest of the landscape projects we’ve attempted in the past, killing only one thing is quite a feat for us. It’s just unfortunate that it’s the most expensive thing we planted. Actually, I may have spent more on those stupid Impatiens than we did on the tree. But those are going to die once it freezes. And they won’t come back next year because they’re annuals. And like a dummy, I’ll probably plant 384 again next spring just because I’ll need something to blog about. I won’t even tell you what your friend (my hub) said about this!!! Love it!! Flowers are the best!! couldn’t you start them from little seedlings? i used to work in a greenhouse and it will save you more than 75% of buying them at the store. hmmm, time vs money. I agree with your mom. bulbs my friend, bulbs! Yes! When they freeze plant tulips! Then when they are done you can plant your annuals! Lovely! We are putting our house on the market next week and I will miss this house so much in the spring. :( I’ll have to start all over somewhere new. I am praying that who ever buys this house will take care of all we have done. It needs minimal love to look spectacular! Those look fabulous! I am impressed. My front flower bed is my nemesis. It is huge, has terrible soil, is filled with weeds and plants that won’t grow. We finally hired someone last week to rescue us. Kudos to you (and Trav and Arle)!